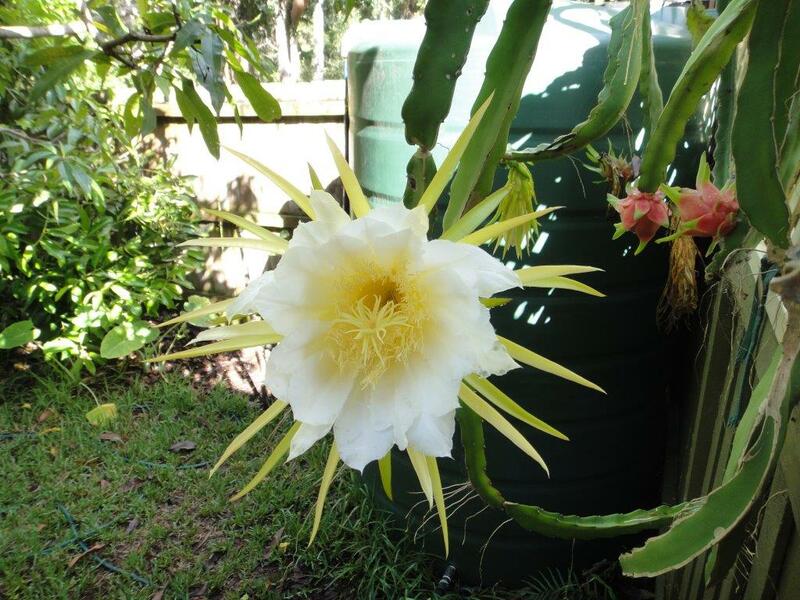 A spectacular night flowering cactus with highly ornamental pink skin & white flesh fruit containing numerous small black seeds. Fruit can be up to 1kg with a melon like flavour. Self pollinating selection from Vietnam. 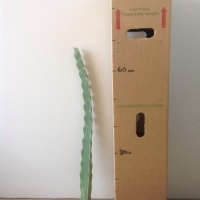 Sourced from Picone Exotic Orchards Guide to planting bare rooted cacti. 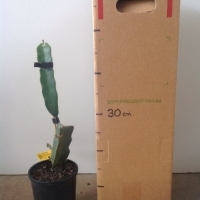 Please note, calloused cuttings are marked with an arrow, plant with the arrow pointing upwards. 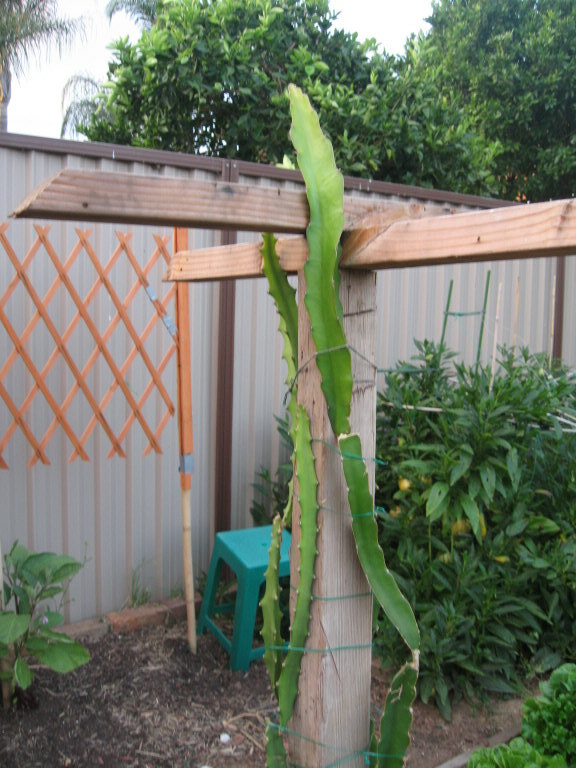 White fleshed dragon fruit cutting taken from a huge vine growing up a gum on Maundrel Terrace. 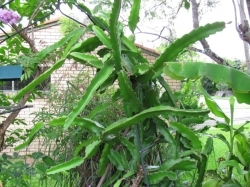 Very quick growing and hardy, and known to produce good fruit with no care as an untended bush/street vine. 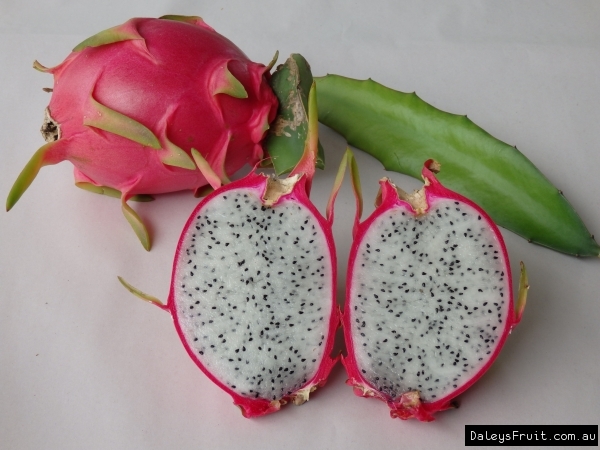 The one in the picture shown was bought from another supplier but it's the same type as the Vietnam Dragon fruit. The fruits are so much more sweeter than the bland ones you get from the shops.I just put together a trellis and is growing the yellow variety in the ground. Hopefully it will give me more fruits. These have been growing very well. My only problem is that I do not yet have enough space for them in the garden so the poor things are still in pots. 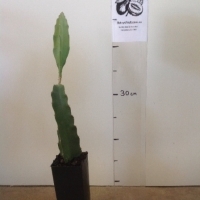 They will never get to fruiting size in pots! 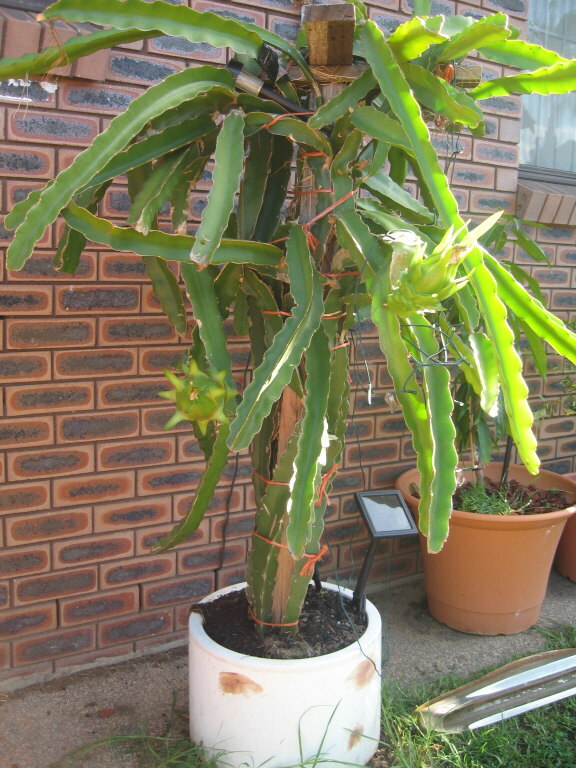 I have found it's best to keep them out of the rain in winter, not that it really rains in Melbourne any more. When it's cold they hate being wet, and start rotting. 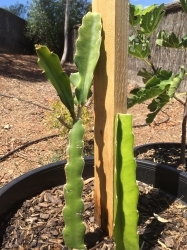 Very easy to grow from cuttings. I took my kids for a walk around my area one day and saw a huge Pitaya plant grown in the front yard owned by an old Vietnamese couple. 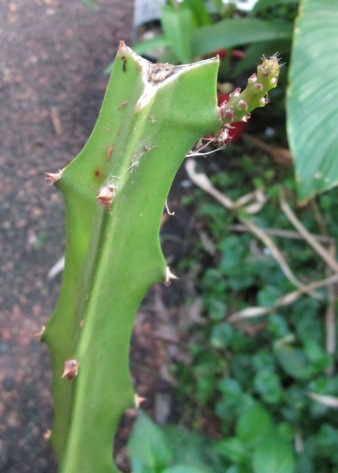 I asked the elderly man for a cutting and he ended upended a small cutting with the root intact for me. It was very nice of him. 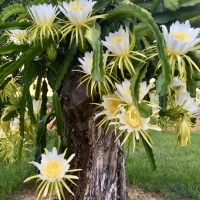 The Vietnam Dragon Fruit is sharing the same pot with the Yellow Dragon Fruit. 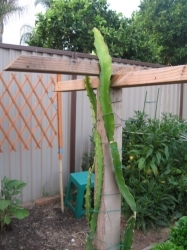 I can't wait till ]my Yellow Dragon Fruit matures, so I can take some cuttings and give it to the elderly couple in return. 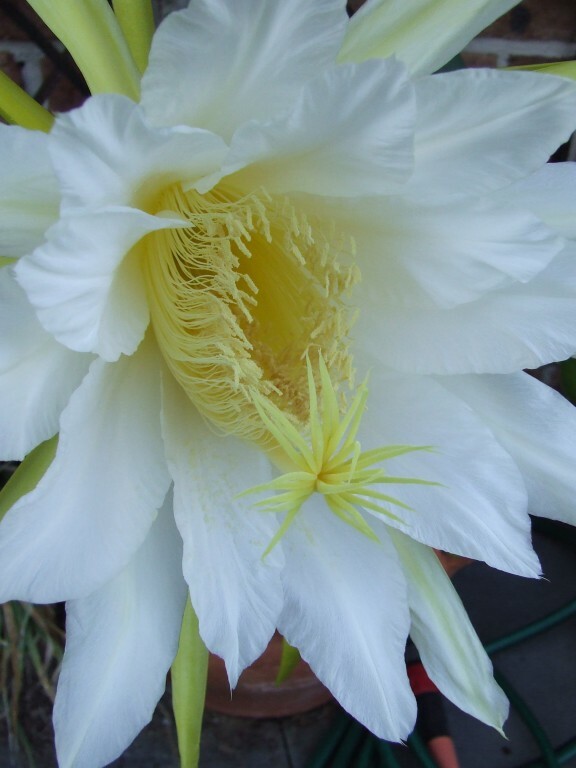 It has only flowered twice so far but despite hand pollination, there was no fruit set. 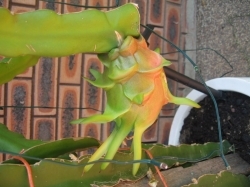 UPDATE: Flowers regularly and sets fruit without hand pollination. Fruit is divine! 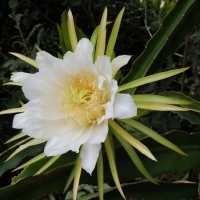 Much sweeter than the white-fleshed pitaya. One in the front and one in back yard. Also a red dragonfruit. 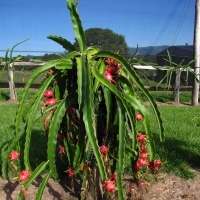 Flowering December - March, but no fruit. 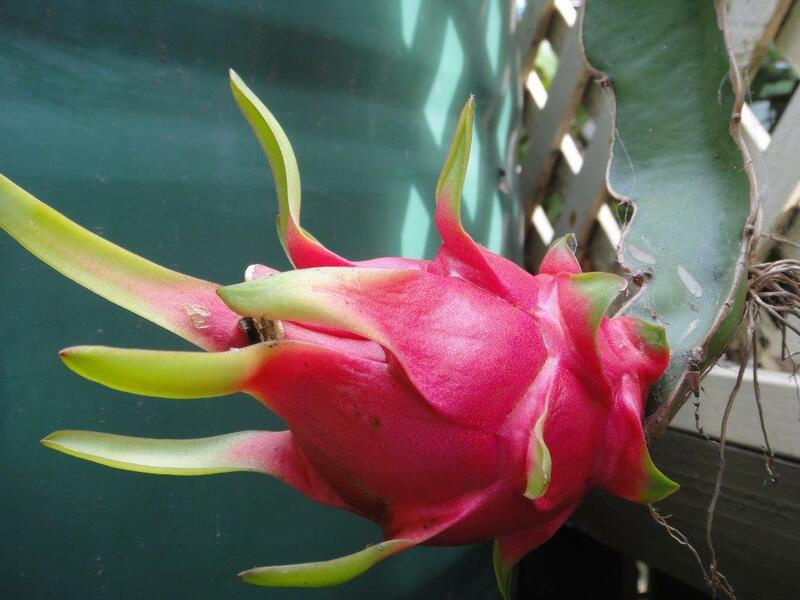 Comments: - This Vietnamese variety produces quite tasty, sweet fruit - red skin, white flesh. Better tasting than the red flesh variety. Should be eaten soon after picking to get best flavour. 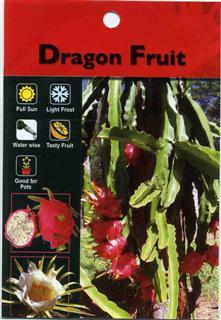 Dragon Fruit is one my my favourite fruits to eat especailly when chilled - so ordered one from Daley's. I have potted it a huge 510mm pot ( ~50L) and drilled heaps of drainage holes, have used my standard potting mix of rich organics and slow release osmocote and planty of mulch, the DF is now shooting new growth and there are smaller buds on it!. Next to the DF from Daley's is a Red DF purchased from eBay - when it arrived it was in a really poor condition and they didnt even root it!! anyway's it's now rooted and starting to thicken up which is good. These DF plants are in full sun and seem to love the hot Adelaide sun so i have not moved them into my semi enclosed pergola area with my other tropicals. Cant wait till they fruit, costing me a fortune buying the fruit from coles/woolworths and the DF is small and old! ohh well haha. Pest Control: Only ants who seem to be all over it?. yet to put in ground. have been over wintering. also having hot discussion with husband about where i can put it. 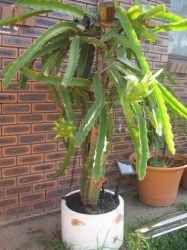 has continued to grow over winter in pot. Growing well in pot. Working out how where to place for fruiting. 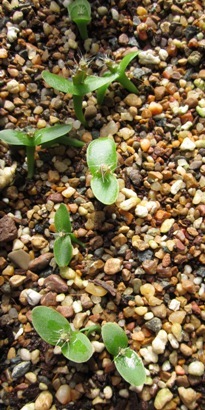 2011 Winter: Growing them from collected seeds. I know that they will take a million years to fruit but I don't know anyone who has a big one for me to take a cutting. Summer 2011: Am also now the proud owner of a cutting (thank you John!). Fingers crossed that it strikes!!! Summer 2012: I have a new shoot on John's cutting! So excited!